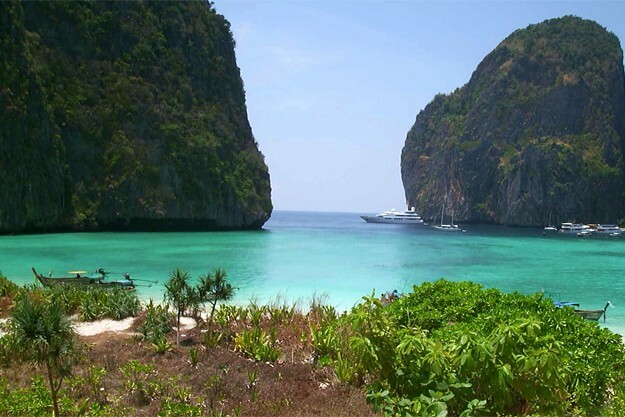 Southwest of Phi Phi Lee island, Maya Bay is located in a rocky cove, which makes it almost invisible from passing boats. Allow at least 3 hours to enjoy the place, including travel by boat from Ton Sai Bay. About 1500 Baht for the boat ride (long tail). 400 Baht entrance fee to the National Park. Maya Bay is fascinating thanks to the myth: a well kept secret of backpackers, the story of an idyllic beach, invisible to the naked eye, totally unspoiled by rocky peaks. A little paradise on earth that everyone talks about but nobody has seen. This is the plot of the novel by Alex Garland ("The Beach"), adapted for film by Danny Boyle, including Leonardo DiCaprio as Richard, a young English backpacker looking for new experiences. 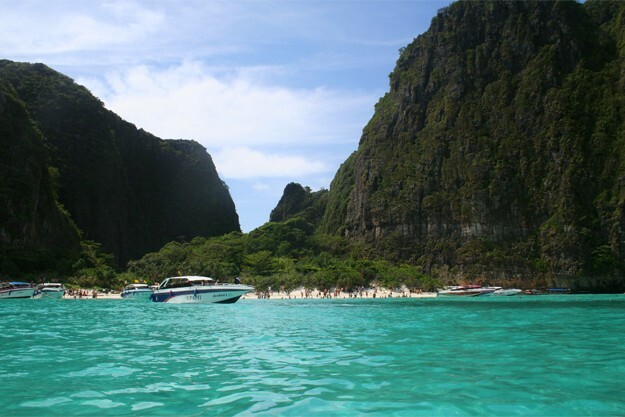 Photo: Maya Bay in Koh Phi Phi. 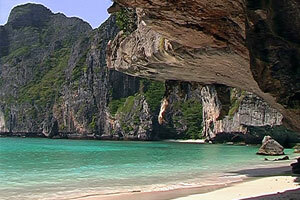 In fact, Maya Bay is not completely closed. An opening in the rock allows boats to dock on the beach. The show is amazing and really unusual. The turquoise waters appear enclosed by rocky peaks, forming an arc of a circle and giving a strange feeling at once reassuring and disturbing: isolation ... but it does not last very long : from 9 am organized tours from Phuket change the landscape with hundreds of tourists, the beach gets really crowded, sometimes making it difficult to find a place on the sand. You need to get up early to enjoy the secret myth of "The Beach" ... or simply give up because, really, there are too many people. Even in low season, the thin strip of sand is full of towels, dozens of motorboats spoil the landscape ... It's far from the postcard's picture people imagine. If you are still looking for an idyllic beach, run to your long tail and flee in the direction of Bamboo Island (Koh Phai).